The other day, I was on the phone with my sister and we were talking about how the world has become a boring politically correct place and of how ignorance can be really irritating and how we are so impatient about the massification of things. I thought about Frida Kahlo. Until then, I had not seen the 2002 movie with Selma Hayek, maybe because of resistance or because Frida’s work had never provoked my curiosity. Seeing her self-portraits everywhere and the fridge magnets might have helped and I had conformed myself to that place ‘haven’t seen it, and I don’t like it’. Two days ago, without even knowing that it was the anniversary of her death, I decided to put an end to it and at least, watch the movie. I remember that one of things that irritated me was the language, for as fas as I knew it, the actors could all speak spanish, the movie is set in Mexico and the historical background is deeply important, but go figure director’s choices. After finishing with it , I searched for a documentary on Youtube and found a very interesting one, which put the other pieces of the puzzle together. 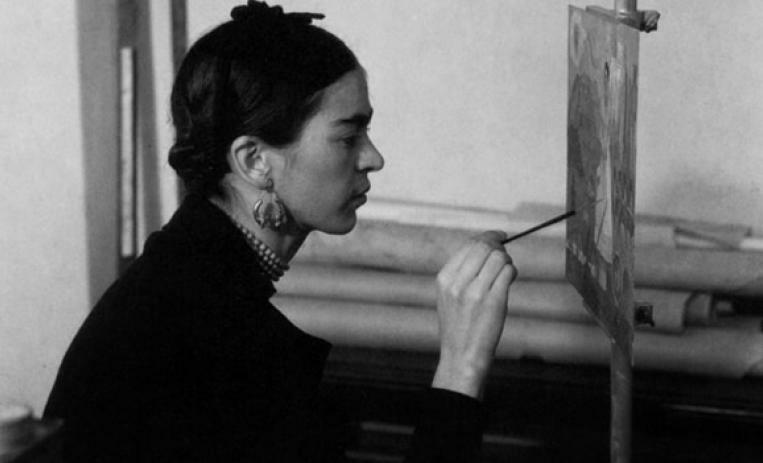 I could see how she painted, always in pain, and the stir that her work caused across the seas. Braque, Duchamp and other surrealists at the time went to visit her in Mexico. She used to say though, that she was no surrealist as she didn’t paint her dreams, but her reality, something which, for the french then fascinated by the early Freud theories, was difficult to grasp. That’s where cultures make all the difference. In a certain way, I understood why I don’t like her work; on the other hand, why I do like it. And there is where I go full circle, knowing that the masssification of things take away their value, contaminate the eyes. What I really like about it is the process, her honesty in vomiting her guts with no intention of making statements, raising banners or provoking scandals: she painted her inner world and said that she did it for herself. I’m still not sure if wether or not I like her paintings, but what difference does it make? None. All I can say is that I’ve been revising some concepts and re-thinking other things and because of that, I know her work is good. And that is enough. Liking it or not, is a different issue.